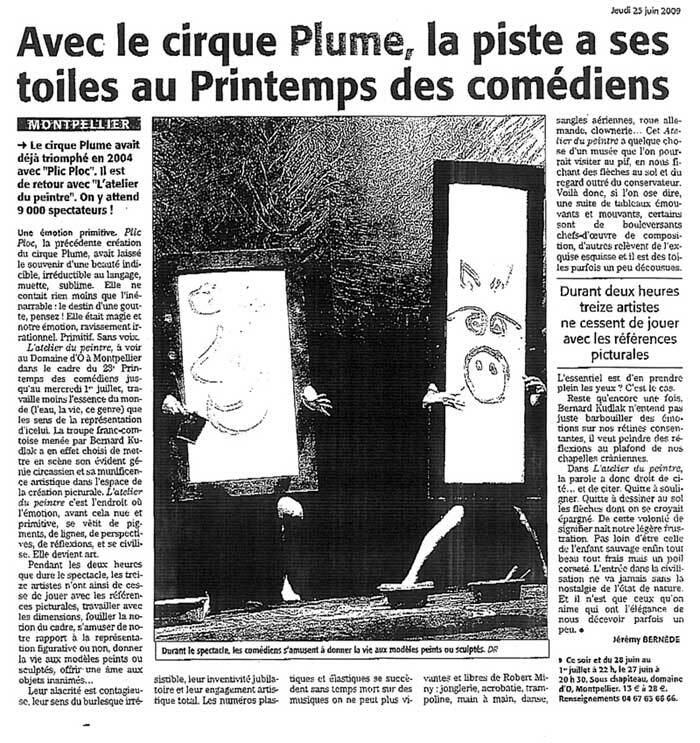 Cirque Plume had already had a big success in 2004 with "Plic Ploc". Now it’s back with "L’atelier du peintre" (The Artist’s Studio). It is anticipated that 9,000 people will come to see it ! Arousing primitive emotions, Plic Ploc, the previous creation staged by Cirque Plume, left memories of indescribable beauty for which there are no words, in fact it was so sublime no words were needed. It was about something quite bizarre: the life story of a raindrop! It was magic and stirred our emotions, being delightfully irrational. Primitive. Silent. The ’Atelier du peintre’ that can be seen at the Domaine d’O in Montpellier as part of the 23rd Printemps des comédiens (’Springtime for Actors’ festival) until Wednesday 1 July, is less concerned with the essence of this world (water, life, people) than the sense of how it is represented. The troop from the Franche-Comté region managed by Bernard Kudlak has in fact decided to combine its obvious circus genius with artistic largesse in the place where pictures are created. The ’Atelier du peintre’ is the place where emotion, which was once unadorned and wild, becomes civilised by clothing itself in colours, shapes, perspective, and reflections. It becomes art. Their eagerness is contagious, their sense of the burlesque is irresistible, their inventiveness is joyful and they have absolute artistic commitment. Expressive numbers follow each other without pause set to music that couldn’t be more lively or exuberant by Robert Miny: juggling, acrobatics, trampolining, "hand to hand balancing", gymnastics, dance, aerial straps, German wheel, clowns. etc. The ’Atelier du peintre’ is a bit like a museum that you can visit on your own terms, without taking any notice of the direction arrows on the floor or the outraged gaze of the curator. You could think of it as a succession of paintings that are both striking and moving, some of them profoundly so, masters of composition, whilst others resemble simple but perfect sketches and some pieces are a little rough around the edges. So the important thing is to let one’s eyes absorb what is on display? Exactly. Once again, Bernard Kudlak is not content just to mess around with what we perceive with our own eyes, he wants to paint pictures inside our heads. In ’L’atelier du peintre’, the spoken word therefore has the right to be there... and to be quoted. Even if it means emphasising the point. Even if it means drawing those arrows on the floor that we thought we could do without. Our frustration stems from this need to find meaning, similar to the feelings of a wild child who is fine and free and yet still a tad constricted. Joining the civilised world never comes without some nostalgia for the freedom of the natural state. And it’s only those we love who have the grace to disappoint us sometimes.